"Lola" even looks like Lola! Yesterday we took Little Miss to the store with an agenda of getting her a doll. I wish I could post a picture of her walking through the store with the doll! She was so excited! 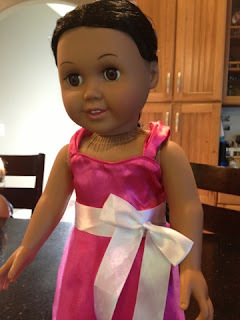 She immediately named the doll "Lola" and began to sing to her! It was the sweetest thing! I got her the doll because one she has nothing, two she loves dolls and plays with Lola's all the time, and three because she is leaving soon and I thought it may help her on her long airplane ride. So far her doll has not left her side! She has done her hair many times and actually colored part of her hair green when I wasn't looking! She has all of the children playing dolls with her. I love seeing Tyce and Jackson doing whatever she says which is pretty amazing since she says it all in Spanish! Yes, she has us all wrapped around her little three year old finger! We have been using the doll to help ease anxiety for her upcoming travels and to demonstrate things like saying sorry to get out of timeout. Who knew a doll could be so useful! It does get a little confusing when talking about her by her name though! Our Lola is taking it in stride and is delighted that Little Miss names the doll after her!